Summary: The fourth cap-and-trade auction in Ontario was undersubscribed clearing only 20,898,000 allowances at a floor price of CAD17.83 with a bid-ratio of 0.83. 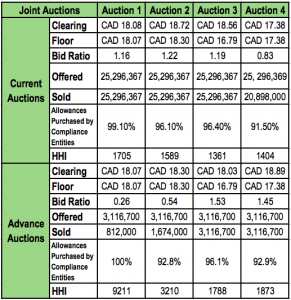 The results would be seen as surprising ahead of the linkage with California and Quebec as the last three Ontario auctions were fully subscribed and the November Joint Auction clearing price was the highest yet. The demand for allowances in the current auction was likely dampened by fears surrounding the provincial election results in 2018. The Progressive Conservative Party has promised to replace cap and trade with a carbon tax if it comes to power after elections in June next year. 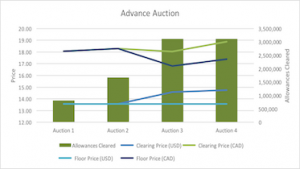 In contrast, the advanced auction was fully sold out clearing 3,116,700 allowances with a subscription ratio of 1.45 and clearing at CAD 18.89, which is CAD 1.51 above the auction reserve price. This indicates that at least some entities hold strong faith in the continuation of the program. Trading activities have remained fairly inactive over the past few months, leaving aside a trade of 3 million tons on the Feb18 delivery taking place on the 3rd of November and 50,000 tons taking place on the 7th of November on the Dec17 delivery. Majority of the allowances purchased in this auction are also likely to be held by the winning bidders as they enter a larger market with a higher floor price next month. The results from the current auction means that Ontario will enter into the WCI carbon market 3.16 million allowances short for the year 2017. Our previous estimate had pegged Ontario to be long by 1.23 million given that this auction was fully subscribed. Furthermore, the province is expected to be a net buyer of allowances from the WCI from 2018 onwards. For more details on long-term demand and supply in the Western Climate Initiative, please see our 2030 allowance price forecast report. The anticipation of linkage with the WCI continues to sustain Ontario Carbon Allowances (OCAs) prices at par with that of California Carbon Allowances (CCAs). 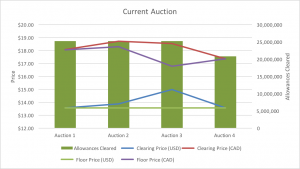 Based on the exchange rate used at time of auction, however, the OCA cleared at a discount of CAD 1.90 to WCI’s clearing price in last month’s auction. The advanced auction was fully sold out with a subscription ratio of 1.45. The rise in interest in future instruments, increasing with each successive auction (especially since the last one), indicates to the positive market sentiment with traders willing to hedge on future options. The certainty brought about for cap-and-trade in future linkage partner California with the help of AB 398 is a factor that has certainly increased confidence in the future of the program. The unsold 4,398,369 V2017s from the current auction will be available at the earliest in August 2018.